This Dish Works with Every Wine – GARGANTUAN WINE. Rather than gleefully imagine the WORST wine pairing in the world (after much drunken discussion, Muscat and spaghetti with red sauce took the prize), honestly, I can’t think of a wine that wouldn’t work with this dish. Leave it to the magical animal that is the pig to have borne such a blessed thing unto the world. 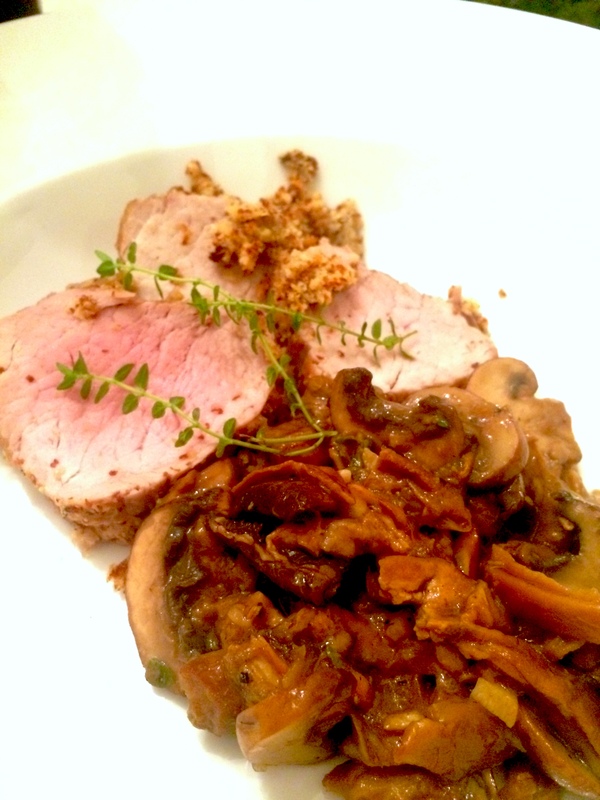 The pork tenderloin is quite simply the Swiss Army knife of wine pairing: I dare you to find a wine which will not work with it. The humble pork tenderloin is always there for you. It’s easy to cook and affordable, rendering it an even better friend. 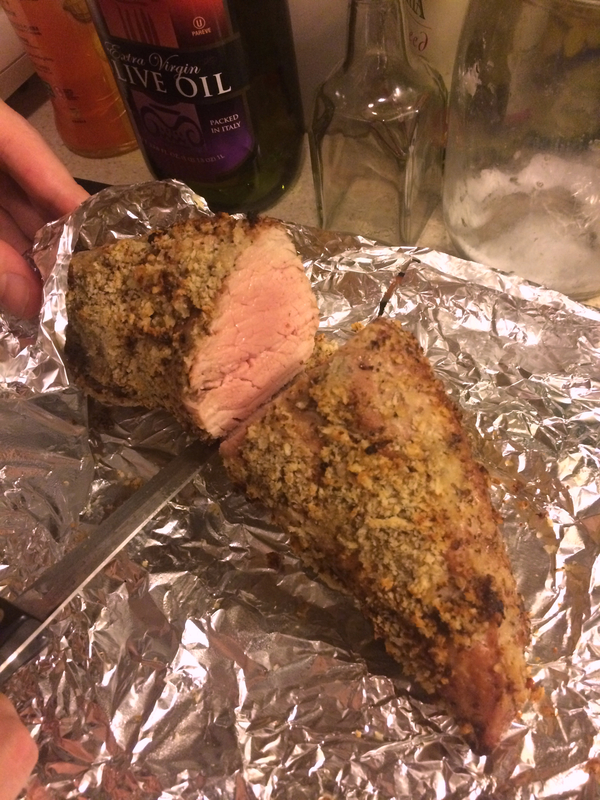 Finding good, fresh pork tenderloin can be a challenge, however. As one might expect, Trader Joe’s is hit or miss, and I suspect this may have to do with their cold chain (often their expiration dates seem the stuff of fantasy, and a sour greenish odor awaits you upon opening the CryoVac well before the best by date). Any other number of stores’ CryoVac’d tenderloins similarly seem to sit for too long. Out here in NYC, Citarella seems to be a worthwhile step up. Here’s the base recipe along with two different embellishments which allow you to “determine” the dish aromatically, adding layers that will act as bridge elements to a red or white. In a nutshell, it’s pork tenderloin with grain mustard and panko crust = red, or, pork tenderloin with marmalade, ginger, honey sauce = white. Honestly, though, if you’re in a rush, you could just brown and then roast the tenderloin, skip the embellishments, and you’d still be just fine. But it wouldn’t be as magical — 80% less oohs and ahs at the dinner table. Here’s the recipe inline, with a couple photos below. Heat oven to 425°F. Place wire metal rack in roasting pan, lightly coat with cooking spray, and place in oven. Remove excess fat or silverskin from tenderloins, season with salt and pepper. Brown tenderloin: heat vegetable oil in a large enough skillet over medium-high heat. Sear meat 5-10 minutes, turning, until golden brown on all sides. BOTH RECIPES: Remove tenderloin and place on rack in roasting pan. Roast 15–20 minutes to 165°F internal temp for well done or 155° for slightly pink. I often undercook to 140° because I fear overcooking, then wrap the meat in foil for 5 minutes straight out of the oven for juices to reabsorb and slightly further cooking. WHITE WINE? MAKE A SAUCE. Meanwhile, in pan used to brown tenderloin, add garlic and shallots, cook over medium heat until fragrant, about 1 minute. Add tomato paste, scrape up browned bits from pan. Sauté until tomato paste has slightly browned. Add mustard, honey, vinegar, thyme, salt, pepper, and broth. Bring to boil, then add ginger, marmalade, nutmeg, and simmer until mixture reduces to a sauce consistency, about 10 minutes. Keep warm. If you cooked it to a total white and you have no pink, you have failed, young Jedi. Mushrooms and red wine are a no-brainer. And if you can think of a wine these recipes wouldn’t work with, let me know in the comments; similarly, if you can concoct a worse wine and food pairing than Muscat and spaghetti with red sauce — hint: toy with Zinfandel, Gewurztraminer, Amarone, and TBAs — I’d just love to hear about it in the comments as well.